The significance of the interrelated connectivity of the gut microbiome and their influence over holistic health is an aspect of wellness not to be dismissed; hence, why we have been focusing on understanding the mechanisms that encourage optimal wellbeing though food, environment, and movement. Today we shall extend the journey to wellness into the effects of compassion on our gut mircrobiome. I often wonder sometimes if there is a misperception of compassion relating to martyrdom. Though there has been quite a lot of emphasis in the media on self-compassion, compassion and kindness to other, quite often these concepts are misunderstood. I really want to begin by assuring you that loving kindness and compassion is not a concept of self-sacrifice, but rather an offering of love for self that allows for love and kindness to other. In Awakening of the Heart Thich Nhat Hanh (2011) speaks of compassion as the seed of energy within us all that brings peace, joy, and happiness. To have compassion is to “suffer with”, and to allow the suffering within to be experienced, validated, and nurtured in benevolence. Allowing the suffering to move through us restores a balance of energies, allowing for holistic health. How does compassion link to microbiomes? In a more scientific manner, this notion of compassion, specifically through compassion meditation, can affect our microbiome through the nurturing and strengthening of the vagal tone. 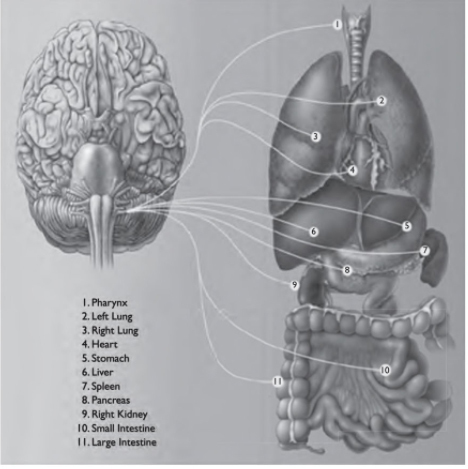 To strengthen your vagal tone is to strengthen the neurological pathways (our brain structures) and the brain stem activity that interrelates to the system of nerves attached between the tenth cranial nerve and the digestive system, lungs, and heart (refer figure one), thus allowing a balanced environment for mircrobiome to flourish. Now, if this all sounds like mumbo jumbo, in short by strengthening your vagal tone you strengthen the integration between mind, body, soul, and the awakening of embodied and relational energy and information flow within and between (Siegel, 2017). A strong vagal tone restores a balance of energies, allowing for holistic health. How do I practice compassion meditation? How I understand others and myself is the essence of compassion. Compassion is by no means a passive entity. Compassion and indeed the practise of it in meditation is the cultivating of awareness of self in relation to body, mind, soul, and other. This looks like deep reflection and the space to allow “honest, direct contact with our own vulnerability” (Tara Brach, 2013). Thus, where we will begin. Begin by finding a safe space; take a moment to clear your mind. Being to take smooth blissful breaths. Deep into the chest. Slowly filling the chest. Then slowly release the breath. Repeat this, coming more and more to presence, feeling the body breathing. Let your body come to natural easy breath. Begin to allow yourself to feel the body. Are there any sensations, internally or externally, that call awareness? Attune to the sensation. Notice where in the body it resides. What does it feel like? Sharp, tight, restricting, tired, sad, angry, nauseous? Know that there are often irrepressible thoughts, feelings and behaviours that arise and affect us. Maybe that which arises lacks words. Anything is okay. Every sensation is okay. It is also okay not to be okay. Within noticing, return to the breath. Allow the smooth bliss of air to encapsulate your lungs. As you continue to breath, is the sensation stirring more within you? Ask: Can I simply allow this sensation to be? Can I remove judgment and allow? And if I cannot, what is holding me back? Am I gentle able to allow the thoughts, words, ideas that are stopping the allowing? Return once again to the breath. Allowing and noticing the depths of the inward and outward movements allow the body to come to relax. Return to noticing, ask: What does this vulnerability want? Why is this sensation asking for attention? Be kind. Say, I notice you to the sensation. I hear you, and it is okay. Continue breath in a self caring, non-judgmental way. When we allow in a non-judgmental space, we are safe, we are loved, and we are whole. In the thoughts, sensations, feelings, and noticing that has come, take a breath. As the breath fills your sense of being, notice what the arisen sensations need. Nurture the wounded self, the fearful self, the child self, the self that needs forgiving, the self that needs connection, perhaps the confused self: Speak loving kindness to that self. I hear you, I see you, I love you, I forgive you, I will never abandon you, I am listening. I respect you, I trust you. As you have spoken these words, imagine clean, fresh, open, loving living air once more filling your lungs to their full capacity. Let it fill your lungs permeating your insides. Every organ enriched with the breath of life. As the air that you exhale flows back into the universe imagine the noticed, allowed, understood, and respected thoughts, sensations, and feelings flowing from your body. Breathe in beauty, exhale fragility. Allow the muscles to relax, if anything more comes to presence, attune, notice, allow, understand in non-judgmental kindness, speak heart. I am loved. As with most meditation, it is only with repeated practice that the unfolding of awareness, the awakening of embodied and relational energy and information flow within and between (Siegel, 2017), is possible. Consider this compassion meditation as a daily practice in order to cultivate presence and to cultivate a grounded sense of being to your everyday life. If this daily, or even weekly cultivation of compassion seems, as it can be, too overwhelming, or perhaps if your mind finds it easier to cultivate compassion among others, a more formal class setting may be more encouraging. At Celia Roberts Retreat in Brookfield, Brisbane, Qld, we offer meditation retreats throughout the year enabling you to experience and to learn how to cultivate compassion in the company of a senior teacher. Compassion for self is an innate necessity. We welcome you to enjoy a weekend of understanding how your emotional wellbeing relates to the science of the mind and hormones, and how this cultivates positive epigenetic changes within you. This weekend is for those who seek to understand the brain and nervous system. We look at stress and anxiety within today's lifestyles, and seeks to teach remedies based in clinical yoga therapy, meditations to heal the nervous system, as well as how the Brain changes itself - Neuroplasticity.